President Trump is about to decide whether to withdraw from the historic Paris climate agreement or even take the US out of the UN climate negotiation process (UNFCCC). The implications of this decision will be momentous for the US and for the world. To explore the possible consequences we have examined a variety of scenarios using the C-ROADS interactive climate policy simulation. The U.S. matters a great deal. The US emissions reduction pledge under the agreement accounts for more than a fifth of all emissions avoided through 2030 (21% of the total of pledged by all nations). 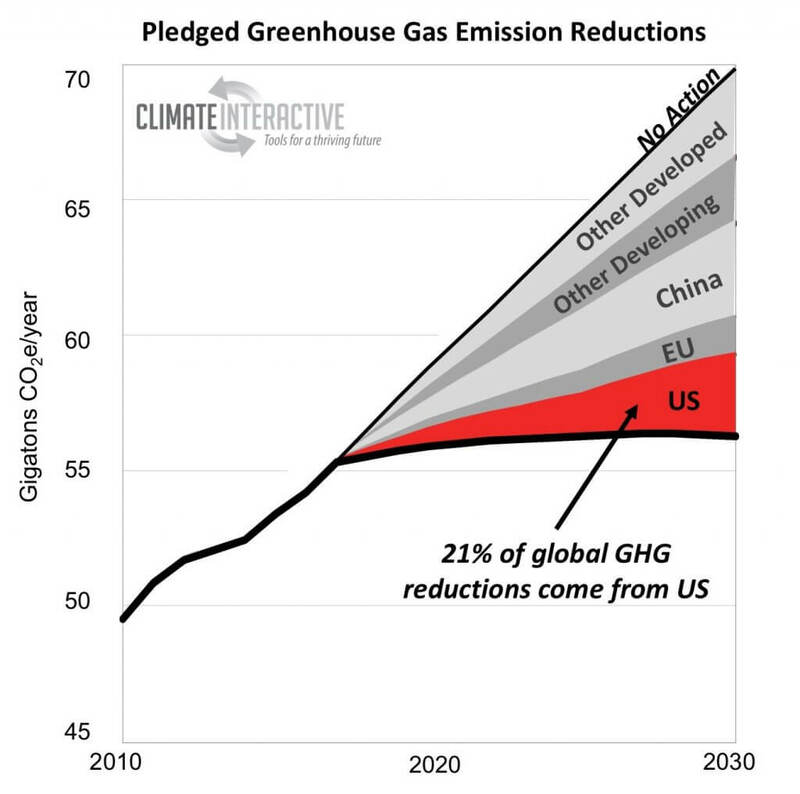 The difference between the US pledge and the US following the business-as-usual scenario (an unlikely outcome, but illustrative of the scale of the US role in climate action in the Paris Agreement) is that US emissions are estimated to be 6.7 Gigatons of CO2 equivalents per year by 2025, compared to emissions of 5.3 GtCO2e/year if the US follows through on its commitments. Global annual emissions would be 57.3 gigatons per year instead of 55.8 gigatons per year, a difference of nearly 3%. US emissions in 2016 were 6.5 GtCO2e/year. If US emissions follow the business-as-usual scenario instead of meeting its Paris pledge, while all other countries fulfill their commitments (and no further action is taken), the world would warm an additional 0.3°C (about one-half a degree Fahrenheit) by 2100. If states, cities, corporations or other subnational entities implement strong actions to reduce emissions independent of US federal action, then US emissions could fall below business-as-usual levels. There are many trends supporting this. If, however, the US abandons its Paris pledge and this leads other nations to weaken their efforts, it could mean the difference between meeting the Paris limit of 2.0° (3.6 °F) and missing it. “Business as usual” is the C-ROADS Reference Scenario. The expected temperature increase in 2100 for this scenario is 4.2°C (7.6°F) with an uncertainty range of 2.5°C – 5.5°C (4.4°F – 9.9°F). The reference scenario accounts the UN’s medium fertility population projections, historical GDP per capita rates that converge over time to be consistent with other integrated assessment models, and GHG per capita projections for each gas that reflect trends over the last decade for CO2 and follow the IPCC’s RCP8.5 for the non-CO2 greenhouse gases. Consult the Climate Scoreboard “Science and Data” page for more details. This scenario, highlighted in our Climate Scoreboard, adds up the contributions all countries have made to the UN climate negotiations. If all nations fully achieve their Paris pledges, and all submitted long-term strategies, average global surface temperature in 2100 is expected to be 3.3°C (6.0°F), with an uncertainty range of 1.9°C – 4.4°C (3.5°F – 7.9°F). The analysis includes Intended Nationally Determined Contributions (INDCs), Nationally Determined Contributions (NDCs), and long-term strategies submitted as of April 18, 2017 and does not include further action for countries beyond the country’s pledge. Consult the assumptions page in the Climate Scoreboard for more information. Here all countries fulfill their pledges as in scenario 2, except the US, which takes no action. This scenario is offered as a thought experiment to highlight the contribution that the United States is making with the Obama-era national pledge. Many feel confident that even if Trump withdraws from Paris some action will continue due to market trends in renewable energy along with state, local, and private sector action. Additionally, future US administrations could resume action to cut emissions to achieve the original US Paris pledge. This scenario achieves 2100 temperature of 3.6°C (6.4°F), with an uncertainty range of 2.1°C – 4.7°C (3.7°F – 8.4°F). The “Below 2°C” scenario is one of over 600 that would achieve the Paris temperature goal, limiting warming to 1.8°C (3.3°F) in 2100. In this scenario, all countries reach a peak in greenhouse gas emissions by 2030 and then steadily cut emissions, with reduction rates in the post-2030 period faster in the developed countries (5%/yr) than in the developing countries (3.5%/yr). It does not include “negative emissions” other than the afforestation pledges that are included in the Nationally Determined Contributions (e.g., in China’s pledge). Details are available here. Scenarios that achieve the Paris goal of limiting warming to 1.5°C (2.8°F) are shown here. Will US withdrawal from Paris lead other nations to erode their goals? So far, other key nations have stated that they will not let a possible US exit from Paris or UNFCCC, or the abandonment of climate-friendly policies in the US that have already been announced, affect their commitment. However, if the US pulls out other nations may weaken their commitments or their efforts to achieve them, possibly leading to a cascade of defections from Paris. Many developing nations faced with the prospect of diminished financial assistance, may not be able to meet their own emissions reductions efforts or make more ambitious pledges. Furthermore, if the US loses its seat at the table, it would weaken US ability to shape international actions going forward, including actions on other issues. Other nations, such as China, the EU, etc. may seek policies that punish the US for stepping back from climate action, including the imposition of border adjustment tariffs on US exports and other policies that could harm the U.S. economy, such as freezing US firms out of contracts to supply renewable energy to other nations. Withdrawal cedes leadership in the emerging renewable energy industry to China and others. It increases risks of conflict in many parts of the world at a time when the administration is seeking to avoid committing US military and troops. It slows job creation in renewables and energy efficiency (industries that are now bigger than coal in terms of employment), jobs that would mostly benefit many working class people who supported President Trump. It continues to harm the health of those same people through continued exposure to air pollution from burning fossil fuels at a time when health care may be cut back. Country Groupings. Most countries are included in either the other developed or other developing categories. The distribution of countries in those groups can be found in Table 3-10 of the C-ROADS Technical Reference Guide. India is included in the Other Developing grouping. U.S. Pledge Post-2025. The U.S. pledge to the Paris Agreement only covers emissions through 2025. For the trend from 2025-2030 and beyond, we used the emissions trajectory outlined in the U.S. Mid-Century Strategy announced November 2017 in Marrakech at the UN Climate Talks, available here. Engaging Others. Climate Interactive and MIT Sloan have developed an engaging role-play exercise used around the world that helps people explore the trends. The World Climate Simulation is freely available in multiple languages. More Analysis. Climate Interactive has examined what the effect of rolling back the Obama-era c limate policies would have here. “Normandy 1944” Quote. 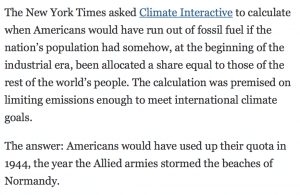 The New York Times article by Justin Gillis and Nadja Popovich included a calculation about when the US used up its share of the Carbon budget (See image to the right). Some background on the calculation: Total global budget from 1850 to stay within 2°C is 2900 GtCO2 (Table 2.2 – AR5). US is 4% of population today so it gets 126 GtCO2. But the US went over-budget (used 126 cumulatively back in 1944 (Note – the US has pumped out 429 by here in 2017). Media coverage of this work has appeared in New York Times, Washington Post, and Associated Press.